The ultra-fast plane would be capable of flying five times the speed of sound. Boeing has unveiled plans for what could be the world’s first hypersonic airliner, a sleek, futuristic-looking craft that the Seattle-based company said would be capable of flying five times the speed of sound, or about 3,800 miles per hour. At that speed — Mach 5 in aviation parlance — it would be possible to travel from New York City to London in about two hours instead of the eight hours the trip takes on a conventional airliner. That means someone could conceivably fly overseas for a meeting and return home in a single day. The as-yet-unnamed plane would be much faster not only than conventional airliners, which cruise at about 550 miles an hour, but also the supersonic Concorde aircraft that flew routes across the North Atlantic Ocean from 1976 to 2003. Concorde, produced by a British-French consortium, could reach Mach 2.04, meaning the New York City-London trip took just under four hours. Boeing’s proposed plane, described in broad strokes at an industry conference in Atlanta this week, could be used for military applications as well as commercial aviation. But it might take 20 to 30 years to take to the skies, Bowcutt said. Supersonic and hypersonic (meaning five times the speed of sound or faster) have been hyped as the next era of commercial aviation since at least the 1950s. But with the exception of the Concorde, which was permanently grounded three years after a deadly crash in France, building such airplanes has proven to be an elusive goal. One key question for Boeing and other aircraft manufacturers will be whether airline passengers would be willing to pay the higher ticket prices that hypersonic air travel would command. 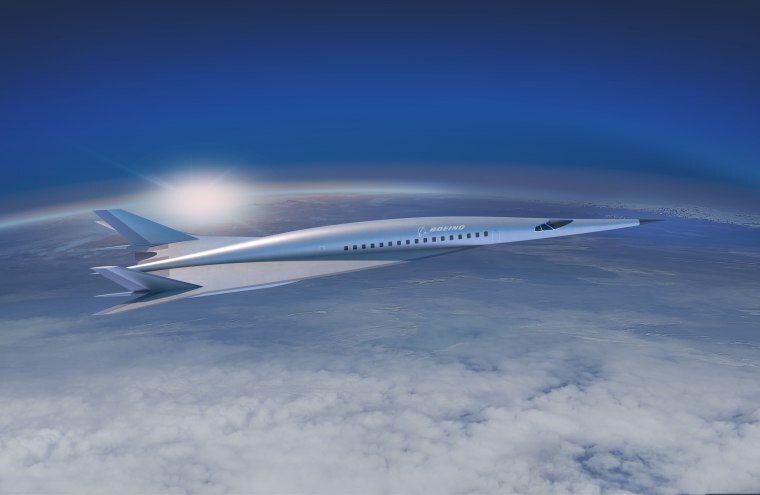 But Craig said new technologies and designs for supersonic and hypersonic aircraft are making high-speed air travel more attractive to travelers. The Concorde’s routes were limited in part because regulators barred supersonic travel over populated areas to protect people on the ground from hearing the loud sonic booms that the plane created. But in the years since the Concorde’s retirement, Craig said researchers at NASA and elsewhere have made significant strides in mitigating sonic booms caused by supersonic and hypersonic craft. As for what it would be like to experience a hypersonic flight, Bowcutt said it would be a lot like flying in a conventional jet — but with a few key differences. Rather than cruising at 30,000 to 40,000 feet, as is typical for conventional airliners, a hypersonic craft like the one proposed by Boeing would cruise at 90,000 to 95,000 feet. But while there would be less turbulence, more time would be needed to accelerate to Mach 5. On a conventional airline flight, passengers feel the sensation of being pushed back in their seats for about a minute or so during and shortly after takeoff. On a hypersonic flight, Bowcutt said, that sensation would last for about 12 minutes.